Last Friday (the stunningly beautiful day in Westminster), I was at Church House Westminster for a gathering of church types who have some level of experience/expertise in the field of social media. I’m not entirely sure how I managed to find myself within such a group, given that, unlike my neighbour to one side, I’ve not written a PhD on church websites; or have a Twitter following of nearly 34,000 like the person on my left. However, having now been to two of these meetings, I can say that I’m glad to be there and hope that I manage to contribute something of worth. One of my contributions last week was in response to a question on how we, particularly as Christians, can remain authentic in our online presences. Should we have multiple presences? [A question posed by Vicky Beeching last week, in response to which Rosemary Lain-Priestly has blogged brilliantly.] Is it enough to simply tweet platitudes? [Short answer: no.] Does being ‘authentic’ mean sharing every last detail? [In my opinion: definitely not!] How do those of us in positions of responsibility maintain suitable boundaries? 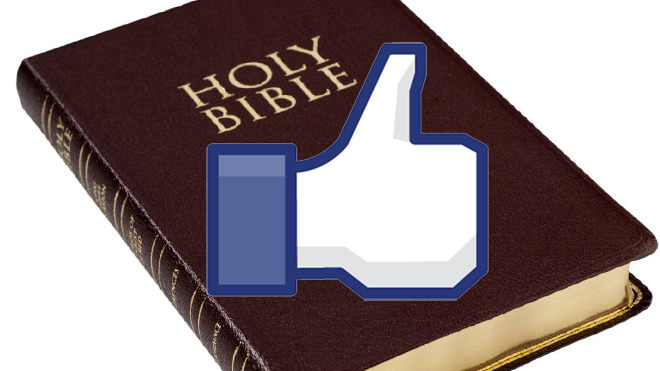 Should everything we post online effectively be evangelistic? Paul didn’t need to ask how the Thessalonians were doing, because he was hearing stories about them from all over the place. In verse 7, the word ‘model’ is used, but it could be better translated from the Greek as ‘imprint’, kind of like stamping your seal into melted wax, or embossing something. The Thessalonians weren’t just acting in a certain way, they were impacting upon the people around them – they were imprinting the gospel upon their lives. Which basically, is where the connection with social media comes in. The Thessalonians had a massive impact upon Christian communities that were forming fairly close to where they were, geographically. It wasn’t too hard for news of their conversion and their faithfulness to spread to Macedonia and Archaia, but bear in mind that the ideas they were sharing – of Christ and the gospel – were still almost brand new and totally alien to the culture in which they lived. Sharing was a risk, but they did it. For the Thessalonians the mission field was nearby provinces, I’d like to suggest that today, for many of us, it’s the online world of social media. The Thessalonians were counter-cultural in the way in which they turned from pagan idols to God, it’s not difficult to see how raising God above society’s idols of today would be counter-cultural in our own society. In the UK, there are 7 million regular church goers, yet there are 30 million regular users of Facebook. The possibilities of reaching friends, friends of friends and total strangers via share on Facebook, retweets on Twitter and attention grabbing blogposts are almost endless. When you share something on Facebook or Twitter it’s not just your circle of friends who can see it, it can go viral – as we’ve seen when people’s use of social media has gone wrong. Yes, we need to be careful, but this is also a powerful tool that can be used to do a lot of good. I’ve been thinking about how we can do both our imitating and our modelling in the world of social networking for a little while now. I love social media – I write a blog, I tweet, I love Facebook a little less, but I can deny that it’s incredibly useful to life. But it’s very easy to make your online life a lot more sanitised than your real, offline life. That photo you’ve detagged? The tweet you posted in error and deleted? The erudite blogposts you spend days composing? Again, when I say ‘you’, I obviously mean ‘me’ – I’ve definitely done all of those things. What followed were the digital discipleship tips I’d already blogged about – the last of which was ‘be inspirational’. It’s that last point which I think particularly relates to Paul’s commendation to the Thessalonians for the way in which they had imitated Christ and the apostles, and how they were now modelling this for others. The Thessalonians shared their news joyfully, inspiring others – how could you do the same? I really want to challenge you all on this. If you’re not into social media, that’s ok – consider this a challenge to reach outside of your comfort zone. But if you are, then think about how you use it and your interactions with people there. If we are living lives that are incarnational – imitating Christ and the apostles and aiming to imprint the gospel upon others – what does this look like digitally and in the real world? If we as Christians are being authentic in our social media presences, then the gospel ought to be ringing out of us in all that we do – whether that’s quoting something spiritually inspiring, behaving in a way that bemuses society, or live-tweeting the Great British Bake Off. The point is, present yourself as you really are – don’t have one account for your Christian followers and one where you share your secular interests. You are one, single person, with a wealth of passions – be honest and authentic in all of them!